Go set the world on fire with the love of God! The year is 1841, the date, August 23. On the pier in Kingstown in Ireland stands a group of Loreto nuns waving off seven young women in their 20s, dressed in the habit of the Loreto Sisters and accompanied by five postulants. These 12 are embarking on a journey destined for Calcutta, India. Their journey will end on December 30 as ‘the Scotia’ sails up the Hooghly River into the Bay of Bengal. For most, it is a final parting from family, home and country. What inspired such madness? Where was the source of such courage and faith? What sustained them in the years that followed? Their arrival in a very different culture where they were welcomed as ‘Priestesses’, the death of some of their members in the first years, the setting up of schools and orphanages, journeys up rivers to places not accessible by road, surely called on a source deep within them. When some died of cholera others were ready to come out and replace them. You are warmly invited to join us for a relaxed and prayerful evening together exploring what is at the heart of our Christian life – God’s call to us, sending us out to love and serve. 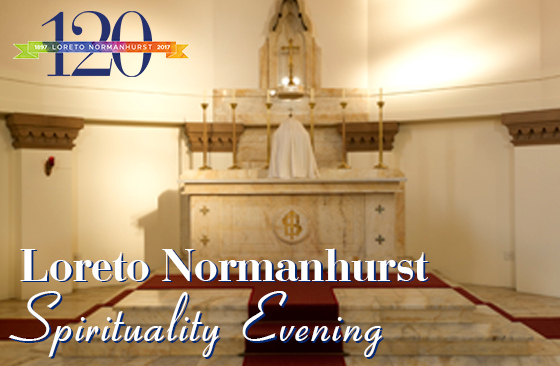 This is the second of our series of three Spirituality Evenings this year, drawing wisdom and inspiration from the stories of three remarkable Loreto women, as we celebrate the 120th Anniversary of Loreto Normanhurst. In our first session we reflected on Mary Ward’s story and spirituality, and this time we turn to Teresa Ball, a passionate woman of deep faith and courage. During our evening together we will hear Teresa Ball’s story, have time for reflection and conversation and end the evening in silence and prayer, experiencing one of The First Spiritual Exercises, a simple way of praying in the traditional Ignatian manner. The evening will be facilitated by Sr Sandra Perrett IBVM and Caitlin Douglas (’87), ex-student of Loreto Normanhurst. We look forward to seeing you there.